So, you’ve spilled liquid on your laptop. Follow these steps to stop liquid damage in its tracks. Do not use a hair dryer to dry your laptop. The heat from a hair dryer can potentially melt parts of your laptop or push the liquid even farther in. When handling the laptop, avoid static discharge. A small shock can cause even more damage to your laptop. Wear gloves when handling any solvents or alcohol cleaners. First, turn off your computer, unplug everything, and remove the battery if possible. Turn your computer upside down to stop the liquid from going farther into your laptop. Pour out as much of the liquid as possible from the keyboard. If your keyboard is removable, remove it from the laptop. You’ll need a cloth or paper towel to wipe the spill off of your laptop. Use the cloth or paper towel to clean off any sticky residue from the screen and or keyboard. Next, if you feel comfortable, take apart the case of the laptop. Some laptops, like the MacBook Air, cannot be taken apart at home. If this is the case, bring your laptop to a repair center. If you have spilled only water, skip to drying. If your spill is something other than water (soda, coffee, wine, juice etc.) you may need to rinse parts of your laptop. Fans or moving parts inside your laptop should not be rinsed. If the liquid you have spilled is water soluble, rinse with 99% isopropyl alcohol then deionized water. 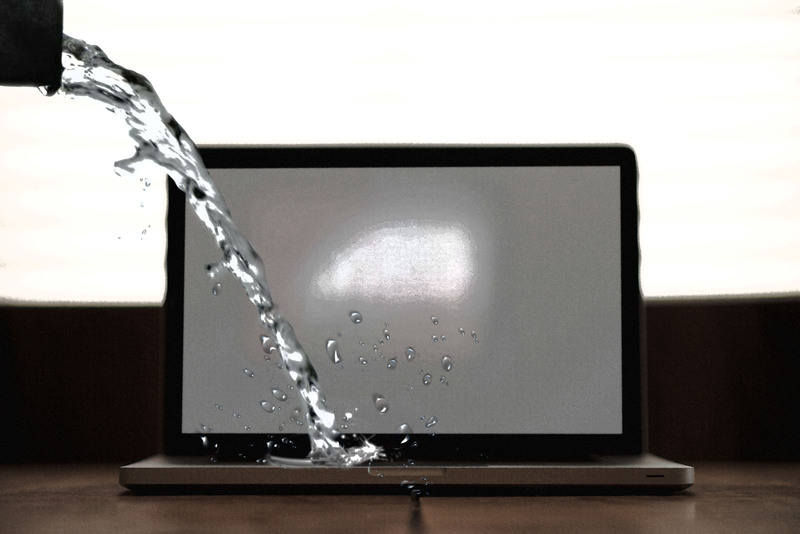 Use deionized water to be sure there is no residue to further damage your laptop. If you feel that your laptop needs a second rinse, use a solvent and cotton swab to clean. 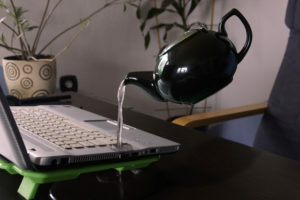 Leave your laptop and any rinsed parts on a dry surface where air can circulate. The laptop should sit for at least 24 hours. The battery can be placed in uncooked rice to dry. Do not plug in or power on your laptop until you are certain that the laptop and its parts are dry. If your laptop still does not function properly, bring your laptop to a repair center to be handled by professionals.